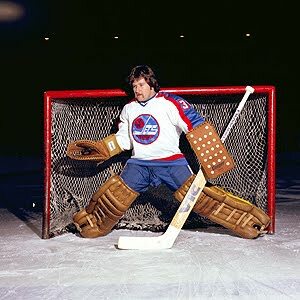 While we get closer and closer to the return of the Winnipeg Jets, we flashback to one of the original NHL Jets who didn't really make the cut with Winnipeg....or many places else in the NHL for that matter. However, he came up from a very unknown source in the NCAA and carved his niche in the minors. This week, the profile of Lindsay Middlebrook. Middlebrook played Junior "A" hockey with the Wexford Raiders in Ontario, before signing on to play with the St. Louis University Billikens, who were a founding member in the CCHA division of NCAA hockey. From the 1973-74 until the 1976-77 season, Middlebrook played 74 games with the Billikens, helping them with two CCHA titles and garnering CCHA First Team All-Star honors in the 1974-75 season. After his college career, Middlebrook signed with the New York Rangers before the 1977-78 season, where he would play between the New Haven Nighthawks of the AHL for 17 games (5-9-3) and then 16 regular season games with the IHL's Toledo Golddiggers, then 13 playoff games helping them win the Turner Cup for the season. With that prior success, Middlebrook stayed in the AHL for the 1978-79 season with the Nighthawks, going 29-19-5 in 54 games, then 2-3 in five playoff games. Middlebrook was named to the AHL First Team All-Star team at the end of the season. With the NHL absorbing or "expanding" the WHA, Middlebrook was left unprotected and picked up by the Winnipeg Jets with their second pick of the Expansion Draft. However, most of the 1979-80 season saw Middlebrook with the CHL's Tulsa Oilers, where he would play in 37 games and compile a 16-15-3 record, then 0-2 in the playoffs. When called up by Winnipeg, Middlebrook went 2-8-0 in his ten games. The 1980-81 season had Middlebrook back in Tulsa for the majority of the time, going 17-16-2 in 36 games, then 4-4 in the playoffs; allowing him to take home the CHL Second Team All-Star honors. When called up to Winnipeg, Middlebrook struggled and went 0-9-3 in 14 games with the Jets. In the summer of 1981, Middlebrook was traded to the Minnesota North Stars for cash. The 1981-82 season would have Middlebrook settle back into the CHL with the Nashville South Stars, where he would play 31 games with a 17-11-2 record; then going 0-3 in the playoffs. When called up to Minnesota, Middlebrook didn't lose a game......or win a game, as he went 0-0-2 in his three appearances. Middlebrook was a free agent and signed with the New Jersey Devils in 1982, who had recently moved to New Jersey from Colorado, allowing him to play with a new team that actually was old. However, he only got in nine games with the Devils, going 0-6-1. He would spend most his time in the CHL again with the Wichita Wind, going 6-7-0 in 13 games. Then, Middlebrook was traded by the Devils to the Edmonton Oilers in the middle of the 1982-83 season, but Middlebrook only played one game-- which was a win-- for the Oilers. Middlebrook was sent to the AHL's Moncton Alpines, going 6-4-1 in 11 games with them. After no NHL offers came, Middlebrook signed with the CHL's Montana Magic, playing in 33 games in the 1983-84 season; going 10-22-3 for that time. In the 1984-85 campaign, Middlebrook went back to the IHL and the Toledo Golddigers, playing 18-25-3 in his 50 games, then 2-4 in his playoff starts. For a third year, Middlebrook moved to another team-- the Milwaukee Admirals of the IHL-- and would have a solid showing the 1985-86 season, going 33-10-0 in 56 games, then 1-4 in five games of the playoffs. Middlebrook would end his career playing with the Danville Fighting Saints in the 1986-87, helping them to the championship of the All-American Hockey League. After winning that title, Middlebrook decided to hang up his pads. 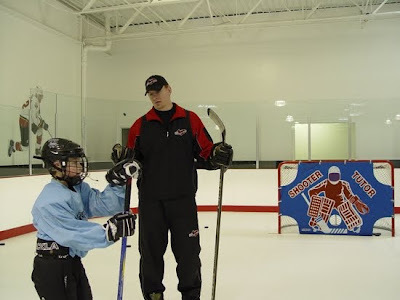 While Middlebrook has seem to been out of the limelight, he has been seen around the Danville, Illinois area in the hockey scene there. While he did have his bright spots, it seems that during a time where you had little leeway to make a mistake-- Middlebrook seemed to have the mistakes following him around in the NHL. He did carve a slight spot for him in the minor leagues, but still could have done better. All in all, he could hang his hat on being with two franchises that were just starting, but moving from either a previous league or previous city. With the NHL taking the next new step into being a more personable brand, it also seems to shed some light into the latest idea they have in order to explain some of the suspensions they have doled out and why. 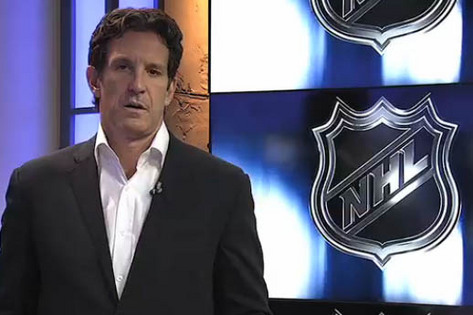 This, of course, is due to Brendan Shanahan's new gimmick of taking to video in explaining and showing why the suspension of the player is given. While he seems to take on the role of Jack Tunney in these videos, it's a smart idea for Shanahan and the NHL to do; because I don't know about you, but I hate reading. Plus, with this-- Shanahan can definitely spot out where it went wrong in the explanation and he gets to do the announcement from that fancy set in some secret mountain base the NHL produces stuff in. It's very unlike any other sport where you can see the hit and have the disciplinarian explain it all-- like so much Clarissa Darling. Sure, you'll have debates on why the same hit carries a different penalty or how one player can get off the hook without penalty when a hit weeks earlier did get penalized-- but at least you won't have the NHL hiding from their reasoning on why someone got the penalty they did. Even so, this seems to show that the NHL wants to be more relatable to the fans and actually takes them inside the process. This could be a good thing, this could be a bad thing. We already have too many armchair GMs and armchair Commissioners around the social media sites and blogging sites that this just adds another facet to the whole armchair expert ideal. That could make some people even more incorrigible, but it's just something that seems to go with the territory. However, this whole thing makes me wonder if people will ever get mad at someone like Brendan Shanahan and lash out at him like they do with Gary Bettman or like they did with Colin Campbell?? Shanahan is a likeable guy from his playing days, very well respected for his decisions up to this point-- but will he get more slack cut from him for it?? Everyone is able to hate Bettman and Campbell because they're the figureheads who are supposed to be hated and they take it in stride. Yet, Shanahan could be a guy that will get the benefit of the doubt from fans and commentators because of what he has done, which will definitely take the heat off of Bettman for the decision making or maybe even creating rules to help protect players; which is a smart move to give someone likable the main stage so the heat won't be as bad. Though, the tide could change with people. Sure, the honeymoon period should be give to Shahanan and with him going out-front with these videos will help his cause. At the same time-- there could be a breaking point for people if while he may be respect, some of his decisions will irk some fanbase, then have a snowball effect from there. It'll be interesting to see if Shanahan will get the same heat as people in his position from the past. All in all, it's a great step for the NHL to take a different angle in order to reach out to the fans and be a little more insight to the reasons why a player was suspended; rather than typing up a press release and sending that out and thinking it's kosher. Whether it ultimately makes things more understandable for the fans remains to be seen, but at least they can say they tried and failed rather than not trying at all. With pre-season underway, many people are definitely hyped up that the game they love is back. Plus, it also allows people on social media sites to be done with the annoying "Is it October yet??" battle-cry that makes me all stabby and what-not. Even with the game back, it definitely doesn't feel the same. If anything else, the only good thing about the pre-season is just to see what your team has laying in wait for whenever players are traded or injured. More often or not, I'm usually watching pre-season games wondering who is wearing those unusual numbers ("Is that a fraction on the jersey??") and then wondering how long it'll take before they're sent back to the AHL or juniors. That said, you will have stories like Mark Scheifele of the Winnipeg Jets, who has had a great rookie camp and pre-season-- it almost makes him someone to watch and see if he sticks with the main squad for the whole year. Scheifele was the first pick ever from the newly formed Jets and would have a great story behind him if he can keep it up. Oddly enough, though, I haven't heard much about Ryan Nugent-Hopkins recently, which could be either good or bad depending on how you look at that. More over, the big deal is that the pre-season allows teams to play in different locations. Last night, there was a game in Baltimore, while the rest of the month brings about locations like London, Ontario; Charlotte, North Carolina; Kansas City, Missouri; Orlando, Florida; Albany, New York; and Halifax, Nova Scotia. Those are cities that may not get to see the NHL during the regular season, so I can actually see the excitement and hype that will come from those games. In addition to that, these games are probably the only time some fans are able to afford a game since regular season tickets are pretty crazily priced. The biggest risk in these games are with the star players on the team playing in the exhibitions probably getting hurt (especially in the neutral site games) or star players not getting enough time, then really getting off to a slow start. Even so, you hear guys like Jarome Iginla having nagging injuries at the start of camp; which will have fans waiting with bated breath when it comes to their return. There's a lot of drama that comes around the pre-season and it's great reporting for the people who have starved for actual news during the summer. It's game action, it's something other than speculation to worry about, and it gets people ready for the impending weather change. It may not be my cup of tea, but at the same time-- guess it's better than nothing, right?? This week's AGM had very few winning seasons to his name, though you have to wonder if that was his problem or the fact he wasn't on many very good teams. Regardless of what it was, he had enough chances to try and break through, but it didn't seem to stick. This week, a look at the career of Marcel Cousineau. The first appearance of Cousineau was in Midget AAA, playing with the Richelieu Riverains, he would go 22-5-0 in 27 games, then going 1-3 in four playoff games before he would jump to the QMJHL's Beauport Harfangs in the 1990-91 season, finishing that season with a 14-29-3 record in 49 appearances. Cousineau was drafted by the Boston Bruins during the 1991 Entry Draft, but he'd return to Beauport for the 1991-92 season, playing in 67 games and compiling a 26-32-5 record. The 1992-93 season had Cousineau start in Beauport, going 12-24-2 in 39 games before being traded to the Drummondville Voltigeurs, going 8-8-0 in 21 games there; then going 3-6 in nine playoff games. 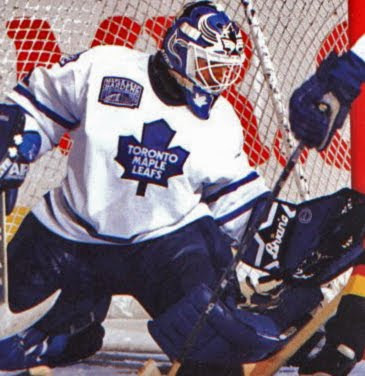 Cousineau was a free agent at the start of the 1993-94 season, but would get signed by the Toronto Maple Leafs in November of 1993 and sent to the AHL St. John's Maple Leafs, playing in 37 games with a 13-11-9 record to show. Cousineau would get the starter's role in the 1994-95 season, but would only finish with a 22-27-6 in 58 games; then go 0-3 in three playoff games. Cousineau would put in 62 games for St. John's in the 1995-96 season, finishing with a 21-26-13 record, then 1-3 in four playoff games for the Baby Leafs. The 1996-97 season had Cousineau get a step up the the NHL with Toronto, where he would play in 13 games with a 3-5-1 record; but he would split his season in St. John's, where he'd go 7-8-3 in 19 games with the Baby Leafs, then 6-5 in 11 playoff games. The majority of the 1997-98 season has Cousineau back in St. John's, finishing with a 17-25-13 record in 57 games, then 1-3 in four playoff games-- all the while making two appearances in Toronto with no decisions in either game. Cousineau would sign with the New York Islanders in the summer of 1998 and play most of the 1998-99 season with the Lowell Lock Monsters, putting up a 26-17-7 record with a 0-3 playoff record. Cousineau also saw six games on Long Island, compiling an 0-4-0 record in those games. Before the 1999 Draft, Cousineau-- along with Ziggy Palffy, Bryan Smolinski, and a pick-- were traded to the Los Angeles Kings for Olli Jokinen, Josh Green, Mathieu Biron, and a pick. Most of the 1999-2000 season, Cousineau spent in the IHL with the Long Beach Ice Dogs, going 15-6-1 in 23 games, while spending five games with the Kings, going 1-1-0. Cousineau would miss the last month of the IHL season due to appendicitis. The 2000-01 season had Cousineau in the AHL with the Lowell Lock Monsters, finishing there with a 15-20-2 record and o-1 in this playoff appearance. With a new AHL affiliate to the Kings, Cousineau would be play with the Manchester Monarchs for the 2001-02 season, finishing with a 10-12-2 record in 28 appearances. With no North American offers, Cousineau went overseas to play with Severstal Cherepovets in the Russian Elite League. The 2002-03 season had Cousineau playing in 34 games with a 1.81 GAA with six shutouts. Also, Cousineau would help Cherepovets win the silver place in the Russian League playoffs. Cousineau would come back to North America to play in the Quebec Semi-Pro League with the Verdun Dragons in the 2003-04 season, finishing with a 17-10-1 record in 29 games. 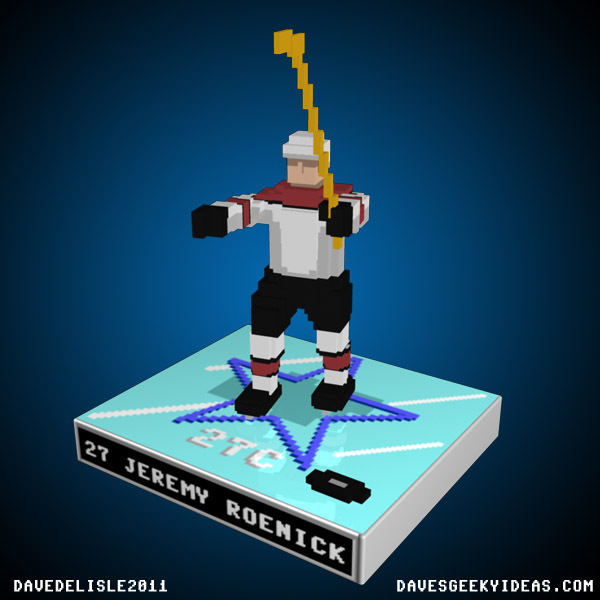 When the league changed its name to the North American League in 2004-05, he played with the Sorel-Tracy Mission, playing in 52 games before he would hang up the pads. The whereabouts of Cousineau since he retired are unknown, but he did seem to have some chances to make a name of himself; but happenstances didn't turn out the way he had wanted. He did get a lot of playoff experience; but did nothing with it due to his teams' inabilities to actually give him any means of support to help him win. With the announcement of Teemu Selanne saying he was coming back, it's time for me to update the list from before about who's still left from the fantastic NHL '94 franchise. That also ties into the NHL '12 release, which was just happenstance. 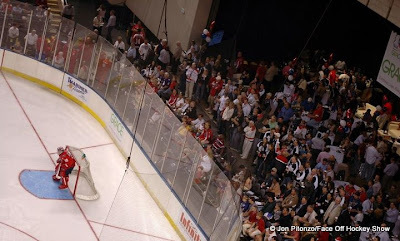 Now, with Mike Modano and Chris Simon still out there as free agents and Owen Nolan only with a try-out contract, we could be in our last throws of this whole gimmick. It's just a clean-up from the old list to make it easier to read. Plus, I still say that I'll buy a jersey of the last player and the team they were on when they finally retire. Former NHLers Say "Hello MoDo"
An interesting article on IIHF.com about the hopes of a revival for one of the most recognizable Swedish Elite teams, MODO Örnsköldsvik, also know as MoDo. The point of the article was the return of some of the stars from their North American careers-- like Markus Naslund as the General Manager and Peter Forsberg as the Assistant GM, then hiring Ulf Samuelsson as the head coach. The article basically goes onward to say that it seems that the MoDo organization could be showing a bit of a North American style because of this for the upcoming season. While the MoDo organization has been quite the factory for producing NHL players, especially with Victor Hedman and Mats Zuccarello Aasen coming out from the team most recently-- is it the best to have the North American/NHL style of play over in the European game?? Sure, there's going to be a change of pace for MoDo as they have all new management and need to get out of their funk of not making the post-season in the last three seasons and not winning a championship since 2007. Yet, is the overhaul of a system going to be the thing that makes this team have a rebound and maybe make this team a force to be reckoned with?? The style it seems that Samuelsson wants to employ is a high-paced action; which on the bigger rink could be great to the start, but if the conditioning isn't there-- the team will falter later on in the season. Plus, the type of player they're bringing in must be comfortable with the system beforehand because of the fact trying to transition to an overly offensive from maybe a more defensive-based system is a shock to the style of play. One good thing is that it could possibly catch other teams off-guard, which would definitely be a help-- but much like the hot play of an unknown goalie in the playoffs; team may catch on, adjust, and if MoDo can't adjust properly to counteract the change of the opposition, they could very well be looking from the outside of the playoff picture once again. It should be an interesting year for the MoDo team, with many of their legendary players coming back to be in a higher position, which also seems to be common theme for recently retired NHLers. Whether this will pay off dividends, of course, remains to be seen-- but it's a nice little something to be on the look-out for outside of the NHL storylines that will be happening. While you have heard a lot of about how much Don Cherry loathed this guy, this week's AGM always got the short end of the stick when it came to his playing days. While he started and then ended in Sweden, many will remember him just for that bile that his former coach spewed about him. This is the profile of Hardy Astrom. Relatively unknown due to playing in Sweden, Astrom first got work with Skelleftea AIK of the Swedish Elite League, playing in 101 games in three seasons from the 1974-75 season until the 1976-77 season. Astrom also was able to get time on the Swedish National Team for the 1976 Canada Cup, where he would play in four games and finish up with a 1-2-1 record. Though, Astrom really got noticed during the 1977 World Championships, where while he went only 1-2-0 in four games, the New York Rangers seemed to take a shine to his resiliency. In the summer of 1977, Rangers GM John Ferguson signed Astrom to a deal with the Rangers. However, the 1977-78 season saw Astrom only play four games for the Rangers (2-2-0), putting him in the AHL with the New Haven Nighthawks for 27 games with a 17-5-3 record to show for it. Astrom also played four games in the World Championships for Sweden. Yet, Astrom didn't like the treatment he got from the Rangers, especially when he came over with the idea of playing full-time in the NHL; so he went back to Skelleftea AIK for the 1978-79 season, where he would play in 26 games over there for the season. Astrom was eventually traded by the Rangers to the lowly Colorado Rockies in July 1979 for Bill Lochead. The 1979-80 season was not a kind one for Astrom, as he would have a dismal 9-27-6 record in 49 games; which would see coach Don Cherry verbal abuse Astrom, especially when it came to a drill where Cherry would dump the puck in on net from center ice....and the puck went into the net. 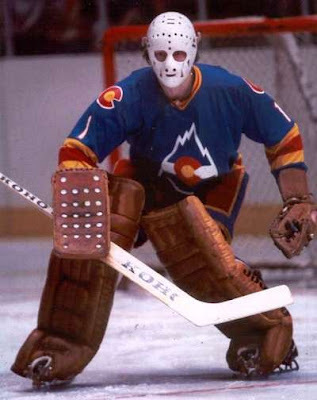 However, the 1980-81 season saw Cherry gone in Colorado, but Astrom staying; but he would go 6-15-6 in 30 games. Astrom would be demoted to the Central League's Fort Worth Texans for seven games, with a 1-5-1 record at the end of the year. In the 1981-82 season, Astrom played with the Central League's Oklahoma City Stars for 35 games with a 12-18-1 record, which would be the last time Astrom played in North America. With the 1982-83 season, Astrom went back to Sweden, but this time with MoDo Ornskoldsvik, though he wouldn't play that season. 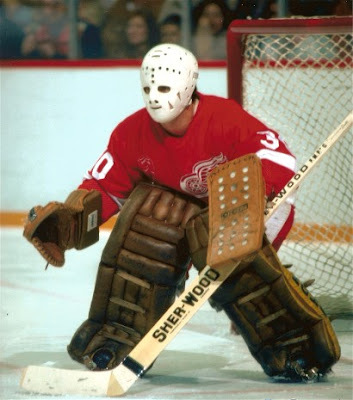 However, Astrom played in 36 games with MoDo in the 1983-84 season, finishing with a 2.16 GAA to show. Astrom would move along to Sodertalje SK for the 1984-85 season, playing in 27 games with three shutouts to his name; then going 5-3 in eight playoff games, helping Sodertalje win the Swedish Elite League playoff title. The 1985-86 season had Astrom play in 28 games, then going 4-3 in seven playoff games. After that season, he would hang up the pads. The man who was dubbed the "Swedish Sieve" seemed like he came onto the scene with high hopes, but after some possible mismanagement and then some struggles with getting great footing in North America, though it did help him out when he went back to Sweden. Even so, you wonder how much he could have shined if he wasn't mismanaged OR if he had patience to stay in the minors to develop to the North American game more. -Fabian Brunnstrom, Detroit Red Wings: For a kid who was hyped and sought after when he was a free agent in Sweden, he seemed to fizzle in the Dallas heat. Whether or not he'll thrive in Motor City remains to be seen, but if there's a team that has the ability to turn one team's trash into a treasure-- it's the Red Wings. They've picked diamonds in the rough for the better part of the past decade and if they are able to figure out where Brunnstrom is supposed to fit in, sell him on it, and then have him succeed; it could be a great reward for a small risk. -Michael Nylander, Philadelphia Flyers: With the neck injury he suffered, it was unknown whether or not that Nylander would be able play again, but it seems that the Flyers have some sign of faith in Nylander to at least give him a look. While he could work very well with Jaromir Jagr, the speed of the game seemed to have taken it's toll on Nylander, as seen during his days in Washington. However, with the lack of offense the Flyers have, it could result in #92 suiting up in the City of Brotherly Love. -David Aebischer, Winnipeg Jets: While his time in the Swiss league has been rough to say the least, the Jets really lose nothing in trying to stack up their minor league or at least give Aebischer one last kick in the can for the NHL. For a team that's under new.....well, everything, it's the perfect spot for Aebischer to make a good first impression. Though it's unlikely he'll unseat Ondrej Pavelec or Chris Mason; should he want to play in the AHL-- it will be there for his taking. Yet, they would have to get over his contract with HC Lugano; but they'll cross that bridge if they get to it. -Owen Nolan, Vancouver Canucks: If nothing else, this could breath some life into the "NHL '94" franchise, should Nolan be able to to make the Canucks. He's one of the few left from that fantastic game, but he could also give some more veteran presence in the room. With 26 points in 24 games over in the Swiss league-- he does seem to have SOME positives to him on the ice, though it'll be seen if he can make it work during the camp. While there are others (Chris Clark, Jay Pandolfo to name a couple), these are the guys who I think will definitely be ones to look at and will probably make the most noise in the camp-- for the better or worse. Micalef started his career with the QMJHL's Sherbrooke Castors beginning in the 1978-79 season, where he would play in 42 games, posting an 18-11-3. The starting role beckoned Micalef after that and he saw 64 games in the 1979-80 season, finishing with a 38-15-7 record; then 10-5 in 15 playoff games, placing him on the Second-Team All-Star team at the end of the season. The 1980-81 season was monumental for Micalef, as he would play in 64 games with Sherbrooke and go 35-26-3, while going 7-7 in 14 playoff games. Plus, Micalef was able to get a spot on Canada's World Juniors team, but went 1-2-1 in five games. However, the big coup came for Micalef when Sherbrooke loaned him to the Cornwall Royals for the 1981 Memorial Cup, as the Royals' goalie was injured. Micalef went 3-0 in his three games, helping the Royals win the Memorial Cup. Micalef took home the Hap Emms Memorial Trophy for top goaltender of the tournament, as well as the Memorial Cup All-Star Team, plus the QMJHL First-Team All-Star squad. That performance allowed Micalef to get drafted by the Detroit Red Wings in the 1981 Draft at pick #44. Micalef was thrown into the Wings cage immediately, playing in 18 games for the 1981-82 season-- however, he'd only go 4-10-1. Micalef was sent down to the AHL's Adirondack Red Wings, playing only one games in relief before being sent to the IHL's Kalamazoo Wings, playing in 20 games there. The 1982-83 season brought some more opportunities, as Micalef would play in Detroit for 34 games and have a better go by finishing with a 11-13-5 record in Detroit, while going 6-5-0 in Adirondack. For the 1983-84 season, Micalef only saw 14 games in Detroit (5-8-1), but would get more time and a bit better performance in Adirondack, finishing with a 14-10-5 record in his 29 games down there. With that, Micalef only played on games in Adirondack in the 1984-85 season (a win) and spent most of the year with Detroit. Yet, in his 36 games that season, Micalef only went 5-19-7. The 1985-86 season wasn't much better for Micalef, as he would go 1-9-1 for Detroit in two stints-- as he would make a seven game stop in Kalamazoo and then a 25 games stop in Adirondack (12-9-0). It would be a quick 1986-87 season for Micalef in North America, as he would only play in one game for Adirondack (a loss), before leaving town. Micalef went over to Europe and signed on for the rest of the 1986-87 season with HC Fribourg-Gotteron of the Swiss League, playing in 13 games there. While Micalef sat out the 1987-88 season; he went to the French League, playing for HC Villard-de-Lans for two seasons, then moving to HC Briancon for two seasons starting in the 1990-91 season. The 1992-93 season has Micalef go to his family's homeland of Italy to play for Vasace Hockey, but he would move on from there to HC Courmaosta for two seasons starting in the 1993-94 season. The IHL came calling for Micalef in the 1995-96 season, as he signed with the San Francisco Spiders, playing in 18 games and posting up a 4-8-2 record. It wasn't enough to keep Micalef in North America. 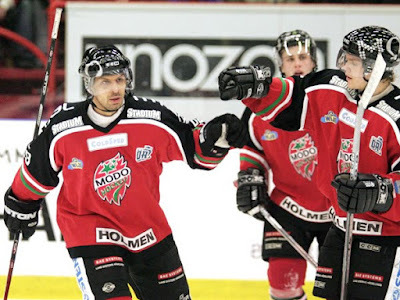 The 1996-97 season has Micalef going to Germany to play in the second divison with EHC Trier for two seasons, then move to Braunlager EHC Harz for the 1998-99 season. Micalef dropped to the third division in 1999-2000 season with ESC Erfurt for two seasons, then moved to ESV Bayreuth for the 2001-02 season before hanging up the pads. Also of note, during his European vacation; Micalef came back to North America in the summer to play for Roller Hockey International from 1994 to 1997, playing with the Montreal Roadrunners, Orlando Rollergators, and San Jose Rhinos. Currently, Micalef stays busy with the PEI Rocket of the QMJHL as an assistant coach for them. While his NHL was not very memorable, Micalef was able to keep plugging along over in Europe and made his way through the lower, unknown leagues and kept his passion alive. While he will be a blip on the radar of the Red Wings history, he was a part of the very lean years in Detroit-- which is a time no Wings fans want to to remember what-so-ever.